The plan was perfect: create a new band in the grand tradition of AOR melodic hard rock. Formed in Sweden in 2014 Perfect Plan follows in the foot steps of other successful Swedish exports such as Work Of Art and Treat. 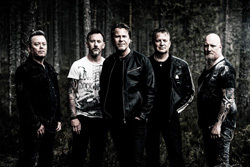 The band is composed of vocalist Kent Hilli, guitarist Rolf Nordstrom, bass player P-O Sedin, drummer Fredrik Forsberg and keyboard player Leif Ehlin. The band was quickly picked up by Frontiers Music to drop their debut album, All Rise. Perfect Plan, essentially, nails the melodic hard rock genre byincorporating all the proper elements in their songs. You know the drill. There's an abundance of melody, harmony, and groove in each song from the pleasing vocal arrangements to the sweet guitar lines to the toe-tapping rhythm section. Hilli has a powerful vocal presence, singing strong, melodic, and with controlled range. Nordstrom delivers fine guitar harmony in his riffs, and then drops some killer solos. With his synths, Ehlin adds accent and atmosphere to each song and, as within What Goes Around for instance, delivers a solo. Underneath, Sedin and Forsberg power the band with a big beat and rich rock groove. It's the perfect musical storm for Perfect Plan. And for my part, I'd say everything song is killer here, not a runt among the litter as it were. You'll find some strong and infectious rockers with the groovy and catchy Band City Woman, the riff roaring Stone Cold Lover, the big beat What Goes Around, and the reminiscing 1985. The AOR accessibility and groove rise within the bit faster Heaven In Your Eyes and Westcoast style ballad, In And Out Of Love. With Gone Too Far, you get something of a heavy rocker, with moderate pacing, a thick bass line, and crisp solos. The conclusion is simple. 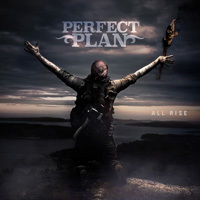 With All Rise, Perfect Plan has delivered an exceptional and entertaining album of pure AOR melodic hard rock ear candy. Quite recommended. Get it. With All Rise, Perfect Plan has delivered an exceptional and entertaining album of pure AOR melodic hard rock ear candy. Quite recommended. Get it.